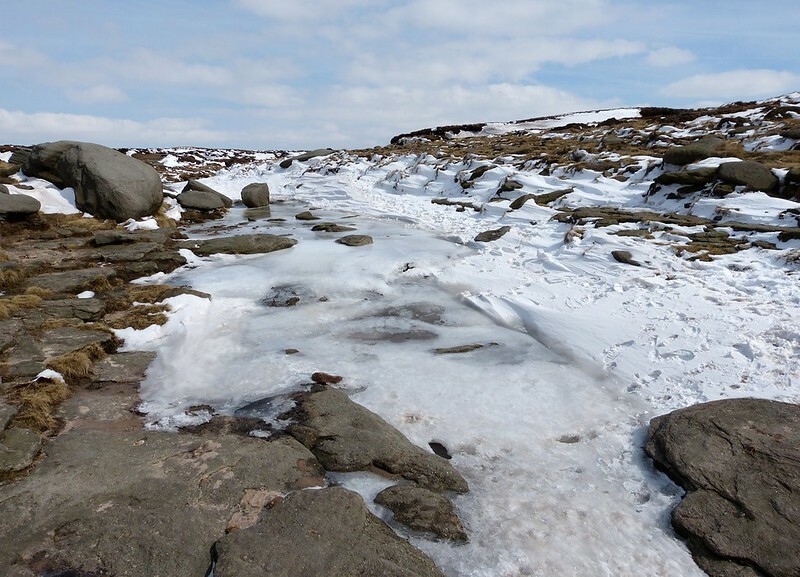 Our final big walk of the Peak District trip was to be on Kinder Scout, something of a legendary location to walkers here in the UK. Back in the early part of the twentieth century much of the open land of England and Wales was privately owned and access refused to all but the privileged few. 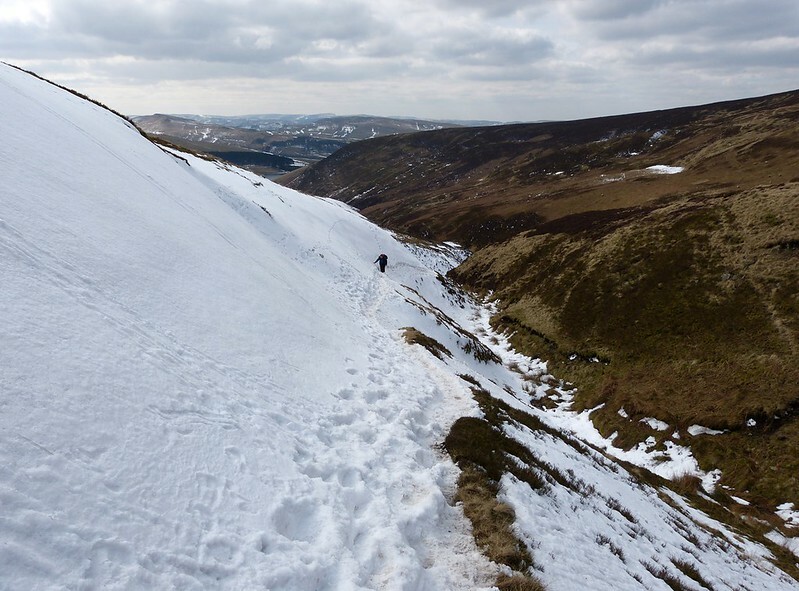 For generations the working class had been campaigning against what they saw as unfair restrictions imposed upon them by the landed gentry, with Kinder Scout often the figurehead of their struggles. 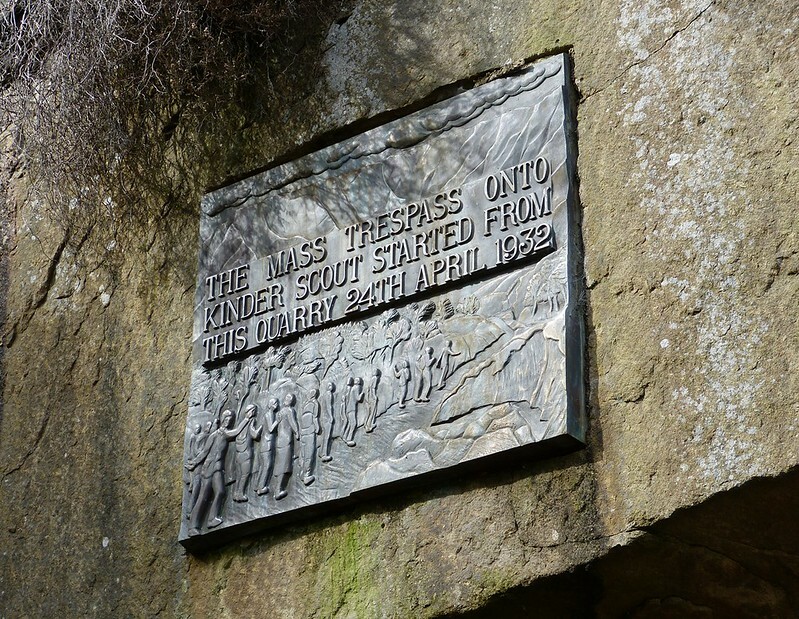 On 24th April 1932 a publicity campaign was launched centred upon a mass trespass of Kinder Scout. Four hundred Manchester ramblers set off from Bowden Bridge Quarry that morning and despite minor scuffles with hired 'gamekeepers' the majority made it to the top. There they met a smaller contingent from Sheffield and having exchanged greetings returned the way they'd come. In the end five people were arrested and jailed for supposed violence but the damage had been done and public opinion was now on the ramblers side. Many years of further lobbying followed but the creation of our first national park in 1949 and the Countryside and Rights of Way Act in 2000 are directly linked back to that historic mass trespass. 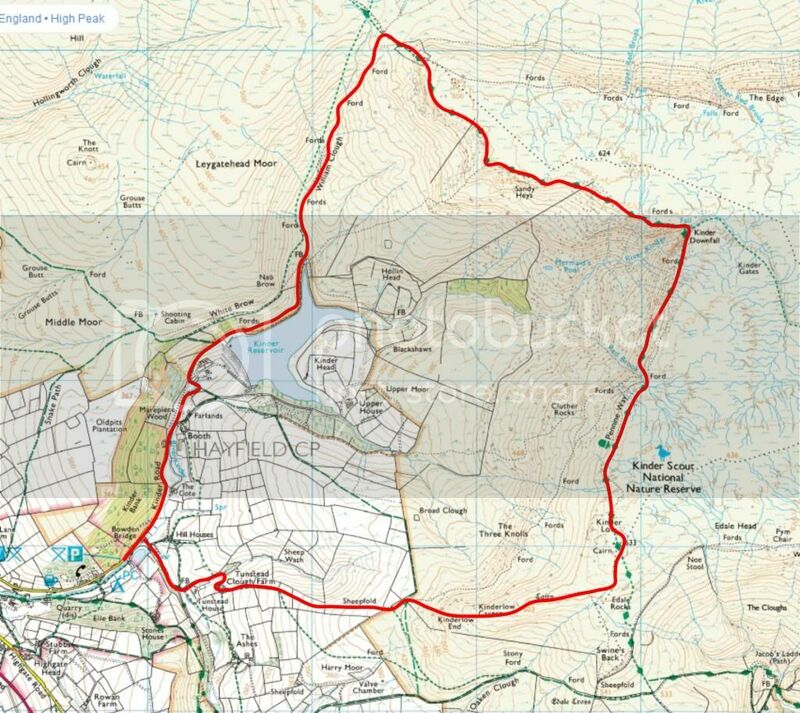 Thanks to their efforts we were able to walk the Kinder ridge on Easter Sunday, starting in that very same quarry. As with previous days the ground was still frozen and although the snow cover was much less than it had been, drifts were still very much a problem. Indeed the first gate we came to actually had to be passed over rather than through such was the depth of snow and ice. 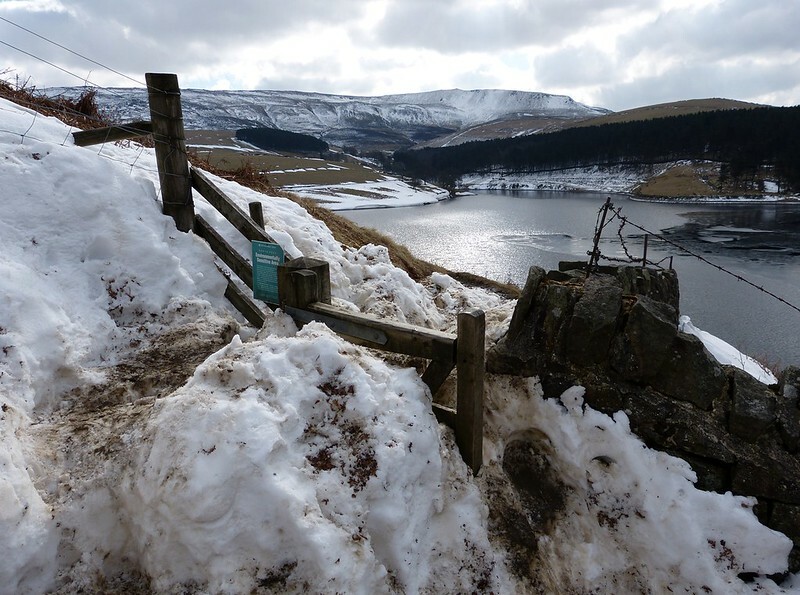 From Kinder reservoir we followed the route of William Clough, a steep and narrow stream valley that heads upwards at a steady pace to join the Pennine Way. Normally the main path traverses the ground slightly higher than the stream itself, but in these conditions it was just as easy to follow the watercourse. Isolated from the cold wind it felt a world away from the wide open moors that were hidden from view either side of us. 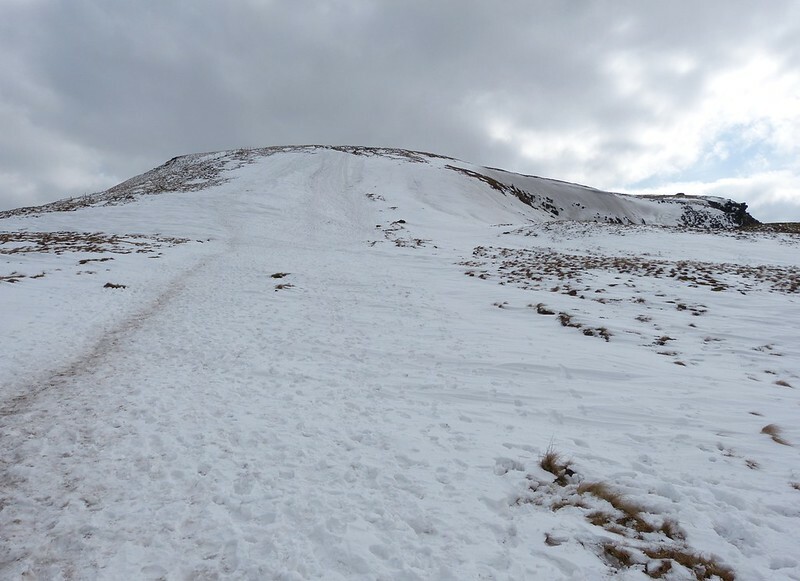 Now back on the Pennine Way we followed its course up one more steep and snowy slope before it was the turn of the ridge itself to guide us. To our left stretched the moorland whilst to our right was the often vertical drop back the way we'd come. All the time weather conditions were changing as clouds rolled in, snow flurries fell and the sun put in occasional appearances. 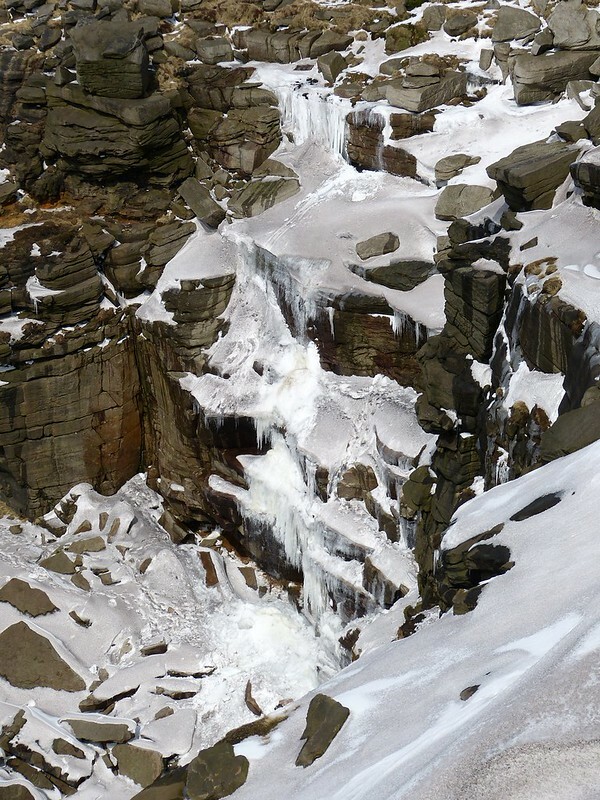 All semblance of spring was soon forgotten as we arrived at Kinder Downfall, the tallest waterfall in the Peak District at some thirty meters. 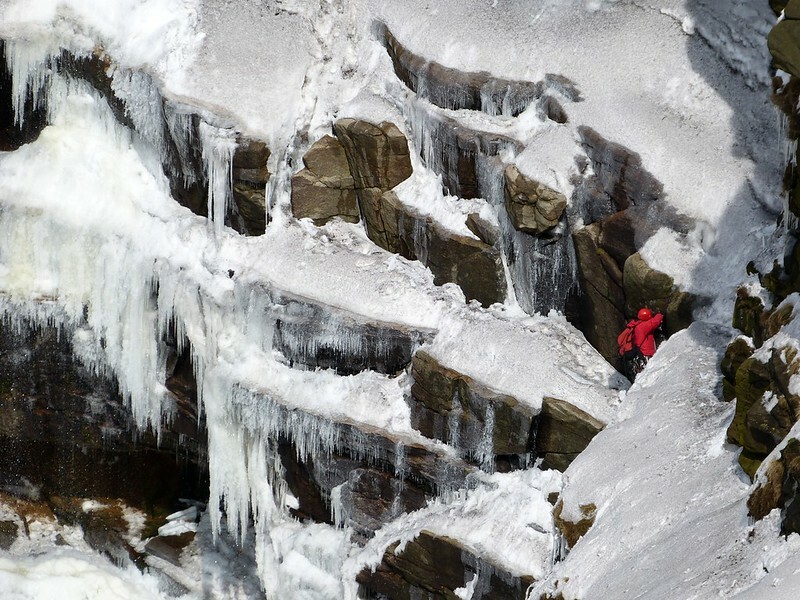 Unsurprisingly it was frozen solid and made for a spectacular sight, though I don't think our new found winter walking skills are quite up to that of the brave person climbing the waterfall itself! Our next major landmark was the trig point at Kinder Low a few miles further on. It was easy enough to find but somehow upon rejoining the path we managed to take an alternative route from that which we'd intended. Normally this wouldn't have been a problem but in these conditions we came across a rather challenging obstacle. Instead of the gentle descent expected we were faced with an almost vertical drop down Kinderlow End. This photo really doesn't do it justice. Having watched a walker ahead successfully make it to the bottom we secured our backpacks and set off after him. Standing on the path whilst facing the ground meant we were still almost vertical and in that manner we began our descent. Each foothold had to be hacked into the snow and ice on what was probably the most extreme section of path I've ever walked. 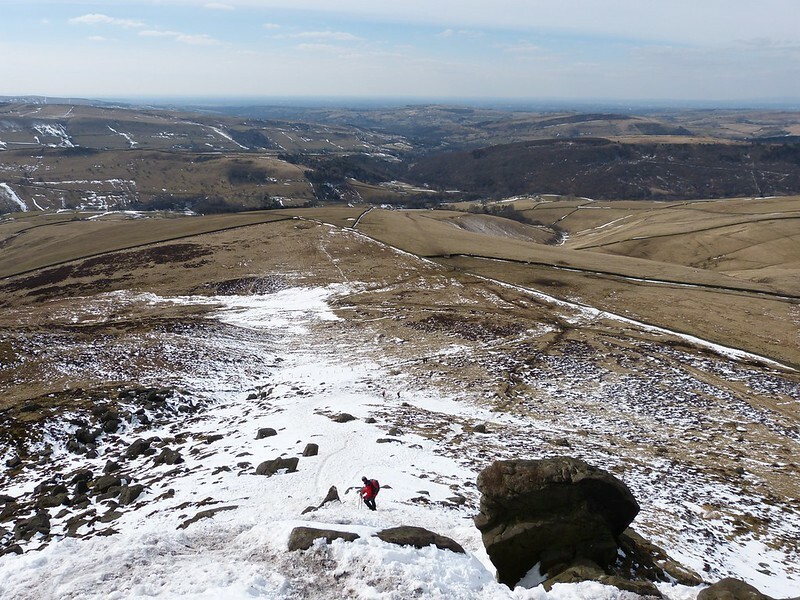 When the ground did eventually start to level out and we could see that there were no exposed rocks, a spot of bottom sledging seemed just the ticket. Probably not the most technical way to get down but a hell of a lot of fun.